And so I have finished the final book on the Carnegie Medal Shortlist! Midwinterblood is essentially a seven part narrative spanning from a time unknown (before the 10th century) to the near future 2073 with a golden thread running through the novel linking each story together. It focuses on a ritual sacrifice on the island of Blessed in 2073 and works backwards to the sacrifice of a King on the same island ten centuries earlier. On his death the King declares he will love his Queen for seven lives and each part of the novel tells the story of a different reincarnation of Eirikr and Melle, or Eric and Merle as they become known over time, and how they find one another in each life. I realise I probably make Midwinterblood sound much more confusing than it actually is, but it is a fairly complex, yet enjoyable narrative. I loved how in each section Eric and Merle’s lives and their relationship is slightly different; from sibling relationships, to an old man who is rescued by a young girl to a girl whose family is reunited due to the actions of a man she has never met. Each story shows a new aspect of their relationship and each is heart warming and portrays how love can prevail and appear in the most unlikely of circumstances. Eric and Merle aren’t the only characters who reoccur and it was always interesting to try and work out how and why these other characters reappear. Undoubtedly by favourite part of the story was set in 1944 as it was unexpected and beautifully touching how Eric and Merle were connected. Now for the most important question; do I think Midwinterblood is a winner? 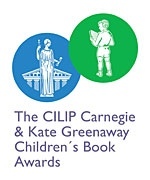 I have now read all eight books on the Carnegie Medal Shortlist and I am pleased that I have completed the Shortlist and all reviews before the winner is announced tomorrow. 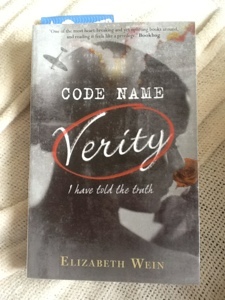 I still want Code Name Verity to win as it was my personal favourite and I LOVE wartime stories, but I have a feeling it won’t. 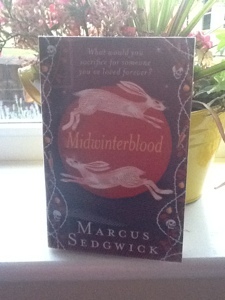 If it is going to be beaten by any book I hope it is Midwinterblood as it is an original and clever story which held my attention and I just loved how all parts of the story were subtly connected and that each section gave us a deeper insight into the characters and yet the whole truth was not revealed until we had learnt were it all began. However I have a feeling Wonder might just sneak in and win it as it deals with issues that are more relevant to teenagers today. I say this and I could be completely wrong…I will have to wait until tomorrow! 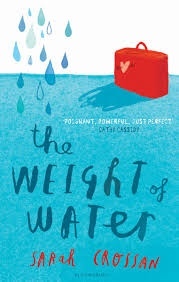 The Weight of Water is told from the perspective of twelve year old Kasienka, a Polish girl who has moved to Britain with her mother in search of her missing father. Her mother is desperate in her quest to find her missing husband and provides little support for Kasienka as she adapts to life in Coventry and the various dramas teenage girls go through at school, from boys to bitchy girls. One of the few things that makes Kasienka’s life bearable is her passion for swimming and this allows her to excel and to find happiness in her new life. The Weight of Water is the seventh book I have read for the Carnegie Medal Award and I read it in a few hours over the course of this afternoon. 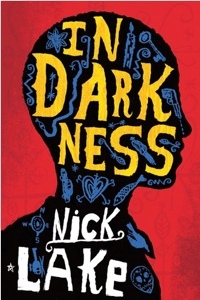 There has been one other book on the Shortlist that I have read as quickly (A Boy and a Bear in a Boat),but this one was far easier to read and engage with. Kasienka was an endearing character with a clear narrative voice, therefore it was easy to warm to her from the opening page and this remained throughout the course of the book. Crossan was able to clearly portray the difficulties facing modern teenage girls, such as friendship issues and boys, and capture how these troubles can be multiplied when moving to not only a new school, but a new country. Overall I would say it was an enjoyable and easy read, but I can’t say it will be one that will stay with me forever as it is very much a teenage book and somewhat simplistic in its narrative. It is interesting in that it offers a perspective on life as a newcomer to Britain and how this can be a trying time for a teenage girl, but it wasn’t stand out for me personally. It was a welcome break from my Classics Club Spin, Charles Dickens’ The Old Curiosity Shop. 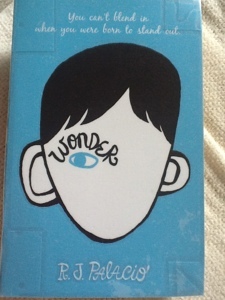 Wonder tells the story of ten year old August Pullman’s first year at school. Up until this point August has been home schooled by his mother and has had very little to do with children of his own age. Like all students starting a new school August is nervous, but unlike most students, August was born with a facial deformity and attending a new school and meeting new people is incredibly daunting, mainly because he knows just how they will react, and just how they will judge him purely on his appearance. I’m really not sure where to begin with this novel. I did thoroughly enjoy it, although it took a while for me to become fully engaged in the story. It is certainly an interesting topic to discuss and I felt that on the whole Palacio handled the narrative in a sophisticated, yet believable way. Yes, August faces prejudice on a daily basis, and some of the behaviour of those around him is shocking, but Palacio also discusses the impact on August’s family and how they cope with the attitudes of others. I did have difficulty gaining interest in the story to begin with, despite the fact that August is a likeable character. No, what made me truly engaged in this story was the narratives of other characters. The story isn’t just told from August’s perspective, although the majority of it is, we also hear from: Via, his sister, Justin, her boyfriend, Miranda, her childhood friend and August’s friends, Summer and Jack. It was interesting to read their take on different events and to fully realise that there are two sides to every story, regardless of what one might think. I particularly liked Via’s narrative. As August’s older sister it is clear that she had to sacrifice a lot so that her parents could look after August, take him to various operations and generally protect him from the brutality of the outside world. Yes, you feel sympathy for August because of how people react/treat him, but I also feel sympathy for Via, who has spent a lot of her childhood on the sidelines, and is now struggling with adolescent on top of this. The one thing I didn’t like, in fact I hated, and this is the English teacher coming out in me again, was Justin’s narrative. The big reason was the use of punctuation, oh yes my old bugbear, but it drives me insane. Justin’s narrative has virtually no punctuation, there are the occasional full stops, but these are not followed by capital letters, and there are no speech marks, making it difficult to follow who was talking. I don’t know what Palacio was trying to achieve with this as for me it didn’t even seem fitting with Justin’s character. He came across as an intelligent boy with an interest in music and theatre, so why the complete lack of correct punctuation. I truly believe that children/teenagers subconsciously learn a lot about spelling, punctuation and grammar through reading, so finding poor examples of it in young adult fiction really annoys me. I don’t care if the author is trying to capture the voice of youth, I don’t think there is any need for it. 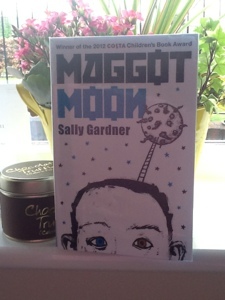 Wonder is on the Carnegie Medal Shortlist and is the second book I have read for my school enrichment shadowing the prize. Do I think it is a winner? Possibly. I would certainly place it over A Greyhound of a Girl, which is the other book I have read so far. It deals with a challenging subject and leaves a lasting impression on the importance of kindness and accepting people for who they are. It is this that suggests to me it could be a possible winner…watch this space! …Roddy Doyle’s A Greyhound of a Girl. This book was not what I expected, completely reinforcing the whole never judge a book by its cover and I put this down to the blurb. Mother and daughters heading off on a car journey. In my mind this suggested a car accident of some kind and I expected the narrative to focus on the aftermath of this. How wrong I was? “What happened to the !! !s?” said Mary. So I did a slight U-Turn and decided this was a clever way of over emphasising a character’s emotions, perhaps not necessary in an adult’s book, but I imagine it is helpful to those who struggle with reading and inference. Once I had overcome this little niggle, I was able to enjoy the book and the journey it took me on. It gives a great insight into the attitudes of different generations of women within a family and their relationships with one another. I come from a family made up predominantly of women, and this has become more apparent due to various family issues over the past 18 months, so this style of narrative certainly struck a chord with me. It really highlighted the importance of strong relationships between women, especially mothers and daughters, something I was not expecting from a male author, but then shame on me for stereotyping. I liked the ghostly element of the novel, and I can clearly see how superstitions ease the minds of those dealing with difficult situations. Do I think it is a winner? It is hard to tell having only read the one book from the Shortlist, but I certainly think it is a worthwhile read.